I've picked a "Word of the Year" for the past few years. Some years I've done better with sticking to that word than others. In 2014 my word was stillness and I was able to gain some inner peace and to reflect on my place in the world. In 2015, I chose to purge and get rid of things in my life and in my house that were weighing me down. I still have a lot to go there! Last year the word was move and we did in a big way! It's not a done deal yet, but it will be this year. Last year was an incredibly hard year for my family. Losing a baby, is without question, the low point of that year. That one thing permeated a lot of other things that happened. Everything seemed harder after that. We decided to go ahead with our house sale, but even that turned into a disaster. I lost a lot of hope last year. My train got derailed and I couldn't find the wherewithal to jump it back on the track. It may seem arbitrary to a lot of people, but the turning of the calendar page is symbolic for me. I need that external push to be able to move on. Just waking up on January First, I said to myself, "It's a new year!" I know that I can't just erase all of 2016, nor would I want to. As much as it was a difficult year, it was also a year for growth. Good things can come out of bad and my family learned and grew together. At the end of the year, I am truly thankful that we are all together. I know that the stresses we went through can tear families apart. I'm not saying we floated; there's be a lot of yelling and crying, but we stuck it out and that's important. I've always been a sunshine-y optimistic person, but 2016 took that from me. There are days when I truly didn't recognize myself. I want that hope back. I want to go back to seeing the good in people and in things. I want to wake up and look forward to the day. 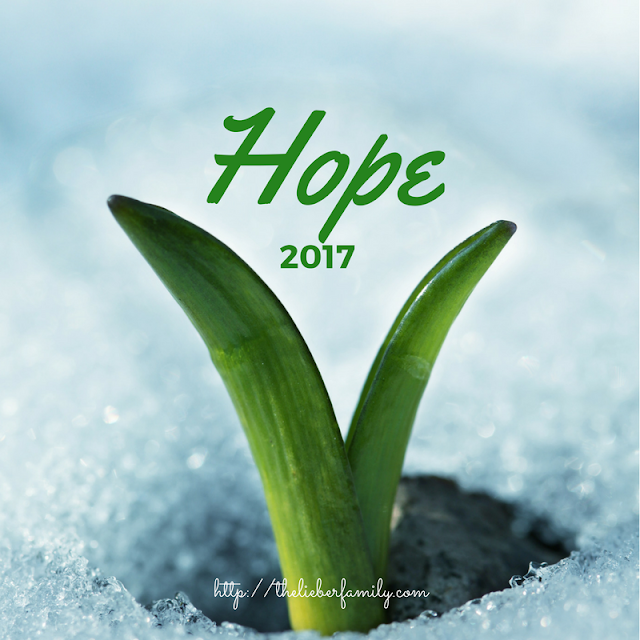 For 2017 I am focusing on hope. My faith tells me that God wants good things for me and I want to get back on track with believing that. I have hope that we will find a good house to move into. I have hope that the kids will get back their feeling of security. I have hope that Ken and I will grow stronger together in this new year. Do you have a word of the year? What are your hopes and dreams for 2017?